The software is designed for streaming music over a network, allowing users to play their music collections from virtually anywhere there is an Internet connection. It supports a large number of audio formats including MP3, FLAC, WAV, Ogg, and AAC. Download and install the Squeeze Center (Logitech Media Server) Add-On. 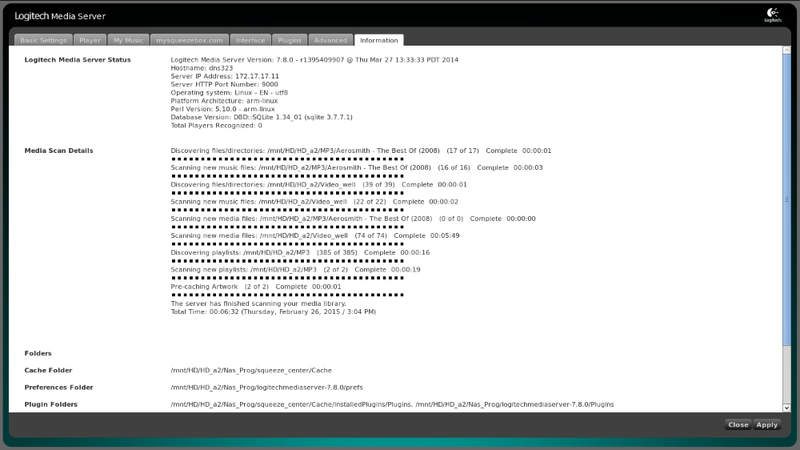 Click the link for the Squeeze Center (Logitech Media Server) web interface and configure it. There are currently no plans to come out of beta, but it is stable now. Is there anyway to get this package to work with the 7.9beta tgz? I have been looking for a way to put this version on my 320L. Logitech Media Server: ARM Linux Tarball (for Perl 5.8-5.14, ARM EABI) should work, but needs some refinement. I can't do modifications, lack of free time.